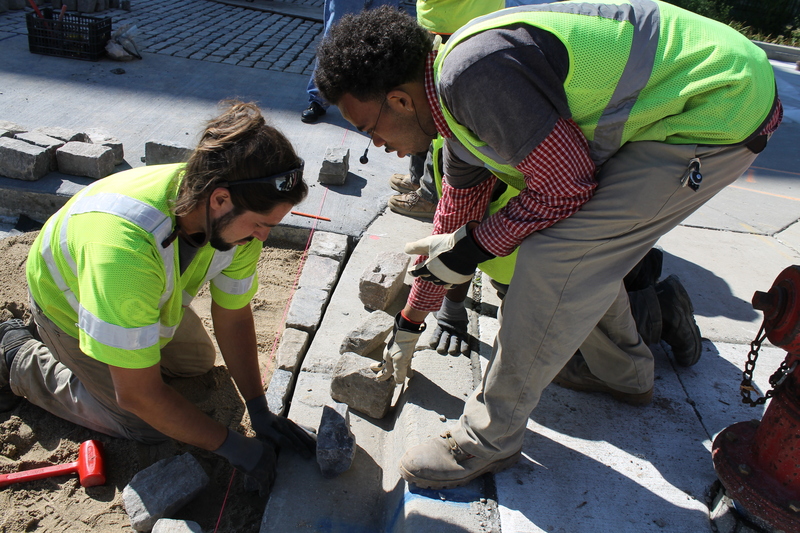 Blue Skies Landscaping employees Jacob Liptack (left) and Jordan Walker lay bricks at The Brewery, the former home of Pabst Brewing, in fall 2014. Photo by Erica Heisdorf Bisquerra. When Henry Hopkins was released from prison in October 2017, he returned to his mother’s home on 14th Street in Lindsay Heights. Growing up in the neighborhood, he had been attracted to the fast life, he said. He ran in the streets and sold drugs, sometimes, out of the 17th Street house that would later become Walnut Way Conservation Corp.
Now, thanks to Blue Skies Landscaping, a social enterprise initiated by Walnut Way co-founder Larry Adams, Hopkins is employed and has earned a steady income for the last year. Having a job has made a difference, Hopkins said. In addition to serving as a pathway to employment in a community where unemployment is three times the national average, according to Blue Skies’ web page, the company earns income for Walnut Way. It also contributes to improving the health and beauty of the community’s environment and has contributed to Lindsay Heights’ designation as the city’s first Eco-Neighborhood. During the growing season, Blue Skies employs about a dozen city residents, most of whom reside in or have ties to Lindsay Heights. Blue Skies crew members perform a variety of landscaping services, including installing and maintaining gardens and trees; masonry walls, paths and other hardscape; and green infrastructure on residential, commercial and municipal property. The company recently added the installation of rainwater capture systems to mitigate stormwater pollution, and coordination of solar energy installation to its list of services. It employs about half of its summer staff in the off-season in training, equipment maintenance and snow removal. Blue Skies gets strong support from anchor institutions across the city, such as Aurora, said Antonio Butts, executive director since July 2017. “We’re responsible for St. Ann’s (Center for Intergenerational Care-Bucyrus) design and installation; Pete’s Fruit Market, America’s Black Holocaust Museum, The Griot Apartments, pocket parks along North Avenue and within the blocks and Fondy Farmers Market,” he said. With the City of Milwaukee’s Home GR/OWN initiative, Blue Skies has transformed 34 vacant lots into public parks. 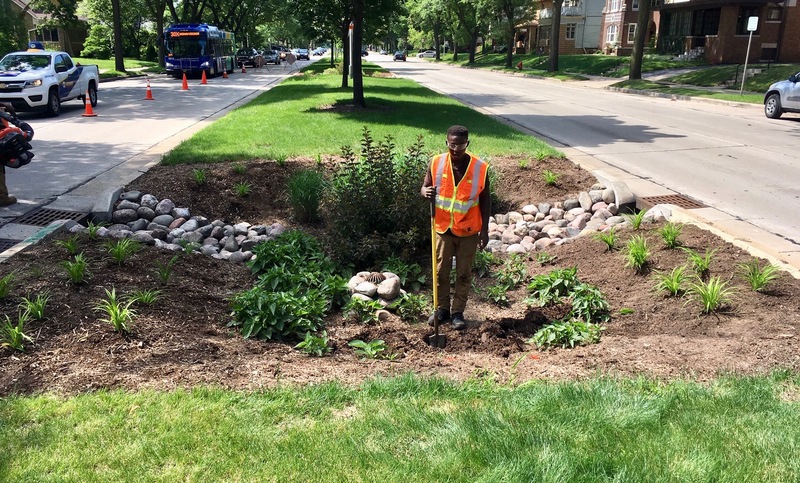 Jermaine Wilson, of Blue Skies Landscaping, monitors and maintains a city-owned bioswale on Sherman Park Boulevard in summer 2018. Photo by Jeremy Davis. Jeff Spence, director of community outreach and business engagement for the Metropolitan Milwaukee Sewerage District, said his organization has worked with Blue Skies in several capacities. The district has provided Blue Skies employees with green infrastructure and water management training. Spence is impressed with the forward-thinking approach the enterprise exhibits. “Not too many people have been able to do what Walnut Way has done” with Blue Skies, he said citing the unique combination of practical capitalism, social equity and environmental sustainability. “And it’s not done (for) just one person to benefit. It’s to benefit the community,” he said. Larry Adams launched the social enterprise in 2012. Since his retirement in 2015, Jeremy Davis has led the effort and Adams said he gives Davis, “who has taken it very far, … a lot of credit.” Having young people invest in knowledge and skills to carry an organization forward is critical to its strength, he said. When Hopkins moved back to Lindsay Heights and reached out for help, Adams sent him to Milwaukee JobsWork, where his brother Michael Adams enrolled Hopkins in a workshop that taught him how to create a resume, fill out job applications and handle a job interview. Jeremy Davis, Walnut Way’s environmental specialist, interviewed and hired Hopkins, whose first choice of jobs was the landscaping business in his neighborhood. The Vermont-based Institute for Sustainable Communities awarded Walnut Way a $150,000 grant last year, which boosted Blue Skies’ financial position as well as providing it with technical assistance and connections to organizations engaged in environmental, economic and social equity around the U.S.
Over six years, Blue Skies has seen an increase of more than 2000 percent in earned revenue from $17,365 in 2012 to more than $450,000 in 2018. That accounted for between 30 and 40 percent of Walnut Way’s total 2018 operating budget, according to Butts. Blue Skies seeks to build a highly skilled team and it invests earnings in training and certifications for employees. “I think the beautiful part of the landscaping program is that (it equips employees) with knowledge that can provide for families in the long run,” Larry Adams said. Arborist, pesticide and permeable pavement training as well as small engine maintenance and repair are some of the skills crew members are trained to do. In 2018, employees attended a 35-hour green infrastructure training and the National Green Infrastructure Certification Program. Now six of only 15 who have this certification in Wisconsin are employed by Blue Skies. Hopkins is one of them, Blue Skies is also funding his continuing education in an MATC welding program. On Feb. 1, Hopkins moved into the Legacy Lofts, a newly developed mixed-income apartment building on North Avenue, near his family home. He said he recently received cost of living and performance raises.